Izzy-Belle, when found, had been left alone in the bitter cold Michigan weather, so cold, she was frozen to the cement porch on which she tried to shelter. Ruthann’s foster kitty, Namir, subcombed to feline infectious peritonitis. 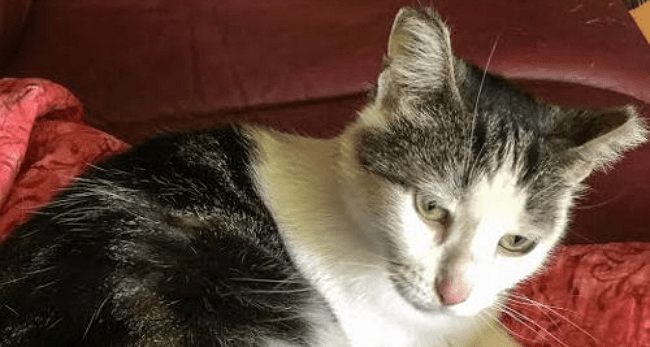 Several months having passed, after living in what she termed ” a one-kitty home,” it was time to balance her scales and get a rescue for both her and her other cat, Titus Andronicus. She went to a local no-kill shelter near her home and was completely enamored with little Izzy-Belle the moment she saw her. The kitten, when found, had been left alone in the bitter cold Michigan weather, so cold, she was frozen to the cement porch on which she tried to shelter. She lost both fur and skin on one side of her body, the tips of her ears falling off, all due to frostbite, and had no use of her back legs having been frozen in a single position for an extended period of time. The shelter that took her in read her microchip and when reaching back to her registered owners, they refused to take her back. So began Izzy’s long, slow, expensive progress toward recovery. Ruthann met many sweet kittens when visiting the shelter, but she found herself constantly returning to Izzy. There was something about that adorable face, that the kitten who wore a red-feather collar and came when called, she simply could not resist. Izzy has, thankfully, fully recovered due to the generosity of the shelter, Ruthann, and, of course, Titus. Although her ears have not yet grown back, it doesn’t seem to have hampered this little girl from being a delightful addition to the household. 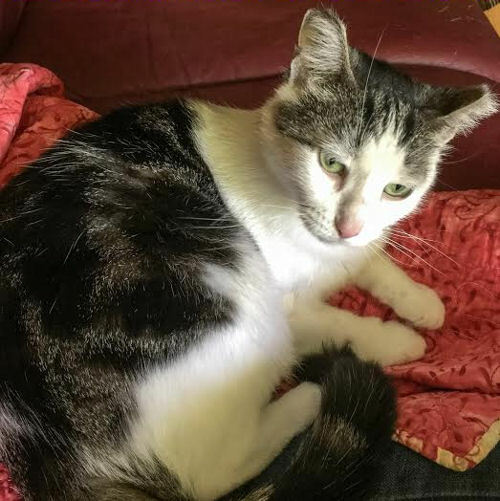 Ruthann shared this happy ending on The Animal Rescue Site and, with hope, it will encourage others to adopt a kitten, cat, or senior cat, into their home. Thank you for sharing this story! It’s amazing that Izzy Belle survived such terrible wounds. I’m so glad she found such a great home. So am I. She is definitely a survivor and certainly deserving of the loving forever home she found. Poor little one, glad she found a home. The old owners should be left outside in the cold.